Erin Taylor has just a few more months of classes before she finishes her undergraduate degree. When she dons her cap and gown on graduation day, she knows who will be cheering the loudest—her mom. Taylor, 30, the daughter of a single mom and full-time police officer, was recently awarded the $1,500 ESME College Award for the Son or Daughter of a Solo Mom. She is set to graduate in August from Texas State University in San Marcos, Texas, with a bachelor’s degree in general studies and minors in criminal justice, psychology, and social work. Her goal is to work with neglected and abused children near her home outside Austin, Texas. Her commitment to public service is something she learned from her mother, Lenora Mason, a sergeant at the Randall County Sheriff’s Office in Amarillo, Texas. Mason, who retired in 2007 from the Civil Division, had a 30-year law-enforcement career and was, Taylor says, the first woman for Randall County working out in the field. Taylor, the youngest of Mason’s three children, says her mother struggled at times with being a Solo Mom. As part of the scholarship process, applicants are asked to write an essay in the form of a thank-you letter to their Solo Mom. Taylor wrote to her mother about how her mother instilled values of perseverance, honesty, and unconditional love. “You didn’t ever, ever, ever give up. You never gave up financially. You never gave up emotionally, and most importantly, you never gave up on me. That, above anything else, is what I hold onto,” she wrote. And there were fun times, too. Taylor described how her mother was always front and center while she was performing as a high school cheerleader or playing basketball. 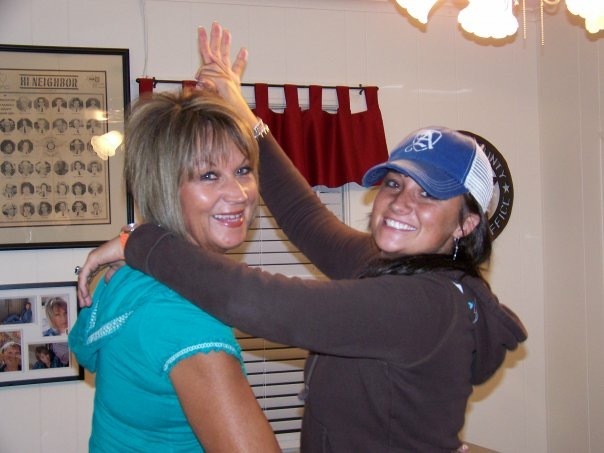 The mother-daughter duo would also hold impromptu “jam sessions” to their favorite bands. Taylor has already followed her mother’s footsteps into the first-responder field. An emergency medical technician who once worked in an ambulance and then emergency rooms, Taylor has been working full time as a hospital patient care technician while going to school. It hasn’t been an easy path but one made easier by her mother’s support. ESME congratulates Erin Taylor and wishes her the best during her final semester!